When it comes to crafts, I am bad. I may want to be amazing, a master of creativity and manual abilities, but it would appear that will power is not everything. Little treasures I found in Laura Lees’ studio. I was ecstatic when I received a sewing machine for my birthday last year. I put my friend Carina through guiding me while I was making my first top from a pattern – she had to finish the sleeves and put the zip in. I decided to shorten my faux-leather trousers – my boyfriend’s mum eventually had to sew them after I “tacked” them (a sewing attempt gone very wrong). She’s so nice; she said it wasn’t my fault: I “just didn’t have the right foot”. I believed her. Hence, you can imagine my surprise/happiness/panic/fear to fail when she gave me a voucher for an embroidery class. It was just my cup of tea… in my ideal world. Off I went, one a very chilly, dark evening, to meet Laura Lees at her studio The Mighty Stitch in Kentish Town, completely unaware of what was expecting me. Needless to say, Ms Lees is a very, very talented lady. 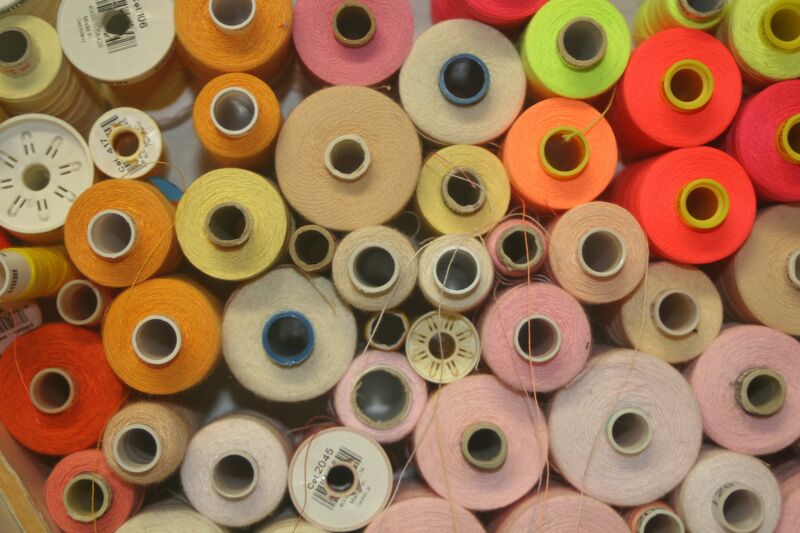 As I stepped into the large, cold room with huge factory windows, a great pile of fabric scraps greeted me. Behind it, Laura was in a cheery mood, walking around and swearing like a sailor having a good time. My fellow attendees were only two to begin with, but trickled in and it the end there were five of us. 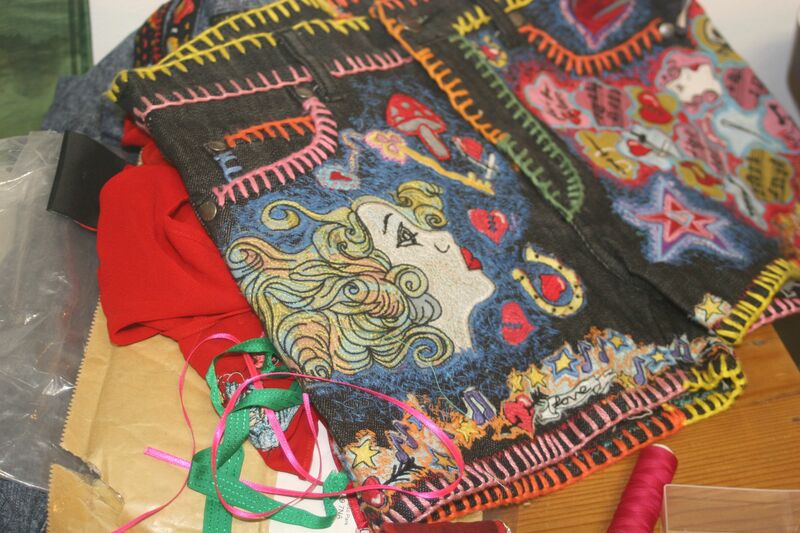 A pair of denim shorts embroidered by me… ehm! I mean: Laura. 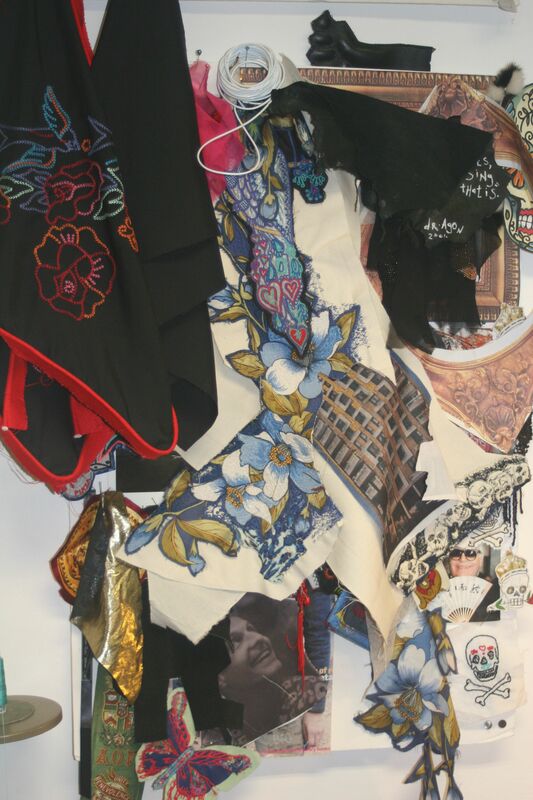 The studio was an exciting melting pot of half-finished jobs, threads and embroidered designs hanging off the walls everywhere. 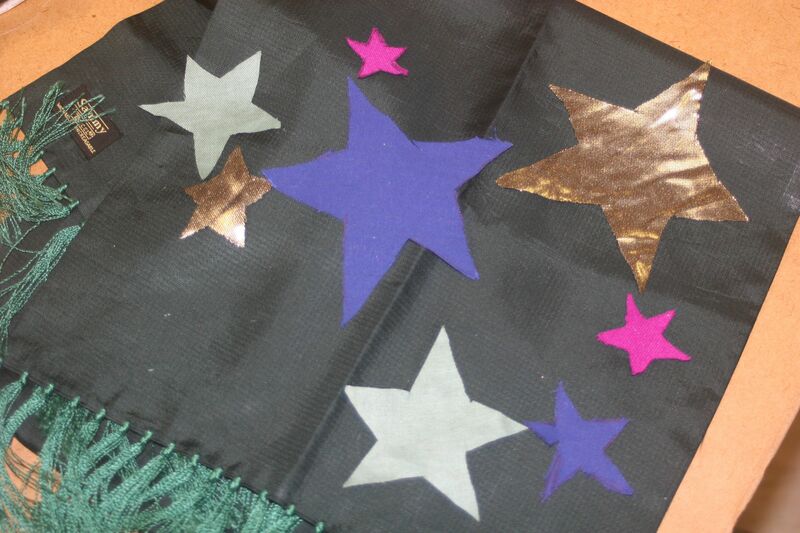 We started by choosing some paper patterns to cut our fabrics on – skulls, stars or butterflies. Then we decided what we wanted to work on. 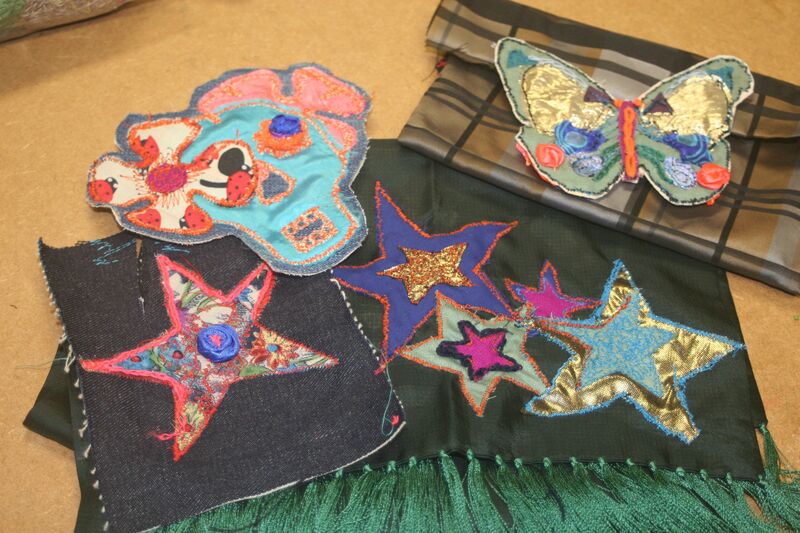 Some of us created a brooch, some others an Oyster card holder, others reinvented a scarf. 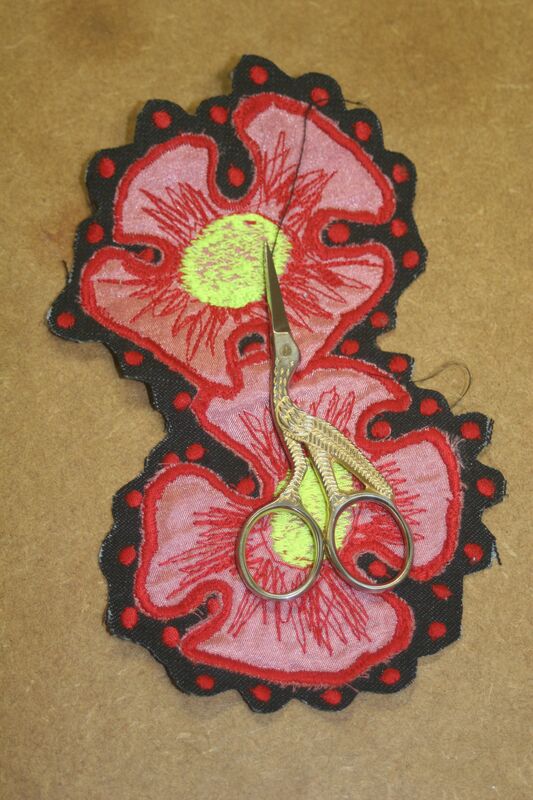 Laura showed us briefly how to use the embroidery machine and that was it – we were on our own, thrown into the deep end. Those are scary, sturdy, mean machines! They can sew through seemingly everything. Laura was always present, helping with technical hiccups, giving advice when asked, but generally, the future of our creations was in our hands. Which is probably where my problem lied. Laying out our work at the beginning. By the end of it I felt: happy I didn’t have to do this again; sad I wasn’t pleased with my creation; fascinated to find out how these gorgeous pieces of embroidery (Laura’s) are created and a little jealous that I just wasn’t able to make something as amazing. But am I glad I went? Definitely. It was great fun to make such a mess, I felt like a child baking their first cake with mum. The final results of our hard work.